Two weeks ago, NASA's Kepler Mission to look for Earth-sized planets around other stars released their first 43 days' worth of data. That's not much, considering the spacecraft has been operating for over a year, but it marks the beginning of the deluge. Simultaneous with the data, Kepler announced a preliminary list of 306 possible planet candidates. That's roughly twice as many extrasolar planets as were previously known, if Kepler's list is 100% planets, which it most likely isn't. Kepler works by looking for transits, when a planet around another star passes between the Earth and that star, blocking part of the star's light. Here are some pictures of the planets Venus and Mercury in transit across the Sun posted by Williams College. The big difference is that Venus, Mercury and the Earth are all in orbit around the Sun, while the extrasolar planets found by Kepler are around other stars, perhaps 3000 light years away! Not every planet will transit its parent star due to geometry, so astronomers have to look at a ton of stars (several hundred thousand in Kepler's case) to find the few planetary systems where the geometry is just right. At those distances, the star looks just like a point of light, even when viewed by the most powerful human telescopes. So, instead of looking for a dark spot to slowly pass in front of the star, the Kepler Mission team looks for changes in the amount of light coming from the star. A big planet like Jupiter blocks about 1% of the light of a star, while an Earth-sized planet will block only one ten-thousandth the light of a star. Today is the first day of summer, which makes it a great day to address the most common misconception people have about the universe around us: what causes Earth's seasons? Most people think they know the answer, and most people are wrong. So, the chances are good that you think you know why we have seasons, and that you are wrong. Now don't get angry about being wrong, and don't get defensive. I'll lead you to the right answer, I'll never tell a soul that you were wrong, and you can go forth and pretend that you knew all along. It'll be our secret. Today, we'll continue through my occasional series on basic astronomy concepts. Previously, we've discussed the difference between solar systems, star clusters, and galaxies. We've also discussed telescopes and observatories. Today we're going to talk about the main way astronomers learn about distant planets, stars, and galaxies: the electromagnetic spectrum. Electromagnetic radiation ("light"). This is by far the most common and most successful method. Gravitational waves. Gravitational waves are like ripples of gravity propagating through the Universe. This might be detectable in the not-too-distant future, but for now they have not been definitively detected. Cosmic rays. These are high-energy particles coming from all corners of the Universe. We can detect these on Earth and in space, but so far it is hard to identify where a particular particle came from (except for the many that come from the sun). Electromagnetic waves, which I'm just going to call "light" from now on so I don't have to keep typing "electromagnetic", seem to have a range of properties. Radio waves carry information, microwaves heat our food, infrared light carries heat and allows us to "see in the dark" with night-vision goggles, visible light is at the heart (or eyeball) of one of a human's primary senses, ultraviolet light gives us suntans and skin cancer, X-rays allow us to see inside our bodies, and gamma rays turn us into monstrously strong, large, green humanoids when we get angry (or at least that's what I've been told). Late last week, the 3 Quarks Daily blog announced the finalists for their 2nd annual prize for science blogging. Alas, I did not not make the cut, but nine thought-provoking blogs did. If you haven't already, peruse the finalists' work here. Winners will be announced next week! Congratulations to all the finalists, and thanks again to my readers who helped propel my entry into the semifinalist round of judging! Orbit of an extrasolar planet detected! The star Beta Pictoris has long had a fascination for astronomers looking for planets around other stars. Now astronomers have taken direct pictures of the first confirmed planet around that star. 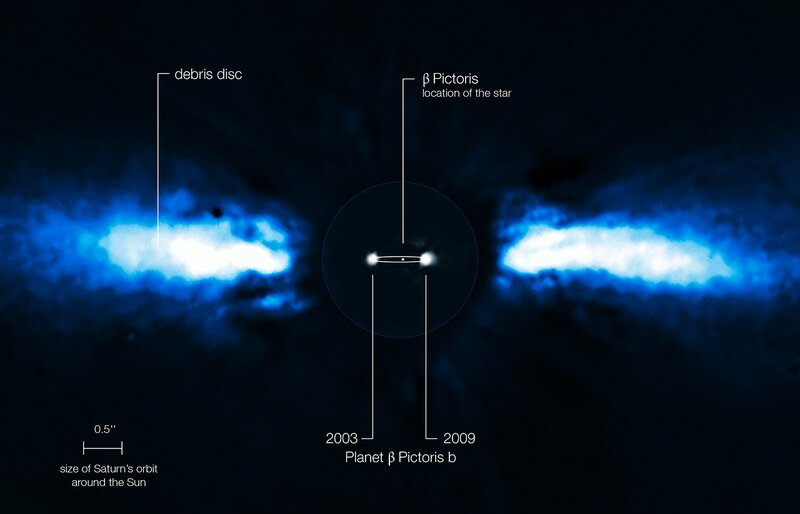 In 1983, the IRAS infrared telescope discovered a disk of dust around Beta Pictoris, the first time dust had been imaged around a star other than the sun. This dust disk has been well-studied since that time. For example, the Hubble Space Telescope looked at the disk and found there were multiple disks, as you might expect if one or more Jupiter-sized or larger planets were tugging on the dust as they orbited the star. In 2003, European astronomers used the VLT telescope in Chile along with adaptive optics (which allow one to see sharper) to look at the dust disk. 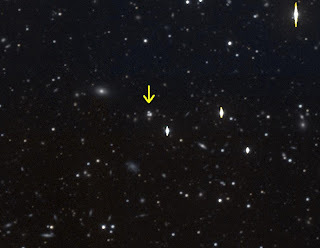 A re-analysis of those images in 2008 found a small dot of light on one side of the star. The dot was roughly how bright we'd expect a planet to be, but it was also quite possible that the dot was another star that happened to lie along the same line of sight. This possibility has burned planet hunters before. The way to tell if the dot was a planet is to look again later. The star Beta Pictoris slowly moves across the sky because it actually is moving relative to the sun. Other stars appear to move, too, but at different rates and in different directions, because they are all moving in their own orbits around the galaxy. We call this movement "proper motion". Stars and planets that are related to one another, like binary stars, will have the same proper motion. So, if we see two dots move together, we can be confident that they are related. This is a very heartfelt "thank you" to all who voted for my post at the 3 Quarks Daily 2010 prize for science blogging. I finished in the top 20, qualifying me for the next round of judging! Now we'll just see how the judges feel I stack up against the competition. If you haven't already, consider taking time to read blog posts by the other semifinalists. The blogs cover a wide spectrum of science. Thanks again for your votes of confidence! Last week, the planet Jupiter was hit yet again again by a small asteroid. This time, the impact was caught on video by amateur astronomer Anthony Wesley, and the impact was confirmed by a second observer, Christopher Go (see June 3), at a different site. The different site confirms that the flash was not caused by something in the telescope, camera, or sky above Wesley's setup. This is cool stuff, and many kudos are due to both amateurs. Even more impressive is that this was Wesley's second impact on Jupiter; he was the first to report a dark spot on Jupiter last year that. Analysis of that spot, imaged by the newly-refurbished Hubble Space Telescope, found that the spot was almost certainly caused by an asteroid and not a comet. Prior to these two events, the only known impact of which I'm aware was the spectacular crash of the comet Shoemaker-Levy 9. So, why the recent activity on Jupiter? Are we witnessing the vanguard of an approaching asteroid armada bent on raining destruction on the Solar System? Today is the last day of voting in the 3 Quarks Daily 2010 prize for science blogging. If you haven't done so already, please head over there and vote for me (only one vote per person, please)! I appreciate your votes of confidence, and a very big thank you to those of you who've already voted. You can read more about the prize here, and visit 3 Quarks Daily often for an eclectic mix of highbrow blogging. Yesterday saw another graduate student join the ranks of PhD astronomers. Ian Roederer, a graduate student in the Department of Astronomy at the University of Texas, successfully defended his dissertation. Dr. Roederer works on metal-poor stars, which are the oldest known stars in the galaxy. In the Big Bang, the elements hydrogen, helium and the tiniest amounts of lithium and beryllium were created. Every other element, carbon, oxygen, aluminum, iron, silver, gold, and so on, has been made in stars since then. Some of these elements are made by nuclear fusion during a star's life, some are made by supernova explosions, and some by rare nuclear reactions in red giant stars. Some elements, like iron, can be made in more than one of these processes. Others can only be made by one process. Everybody likes to win prizes. In the past few days, a few major astronomy award winners have been announced. Also, voting has opened for an award on science blogging, and I want to win! Let's start with the science blogging contest. As I mentioned last week, the blog at 3 Quarks Daily is holding their second annual prize for science blog writing. The first part of the contest, nominations, is closed. Now it is time for the public (i.e., you) to vote on the best blog writing. The top 20 vote-getters will then be judged by the 3 Quarks editors, who will pare the list to 6 to 9 finalists, with the winners chosen by Professor Richard Dawkins. The three winners get cash prizes! So, head on over to see the list of nominees for the science blogging award, and then vote for me! (Or, if you must, someone else.) Note that you may only vote once, so rather than breaking the rules, please convince your friends and neighbors to vote for me, too. I promise to spend any award money on science education (except I will treat myself to one deluxe caffeinated beverage in celebration). Voting ends on 11:59pm EDT on June 7, so head over there and vote for me today! Now, before you forget! 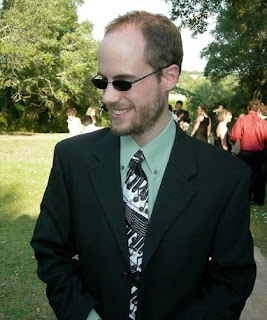 The 2010 Gruber Prize for Cosmology goes to Professor Charles Steidel. The Gruber Cosmology Prize is an award co-sponsored by the Peter and Patricia Gruber Foundation and the International Astronomical Union. The prize is one of the few major awards devoted specifically to astronomy research, and is akin to the Nobel Prize in prestige among the community (astronomers can win the Nobel Prize in Physics if their work relates to fundamental physics, but most astronomy lies outside this interpretation). Steidel has led many of the pioneering observations of galaxies in the very early Universe. 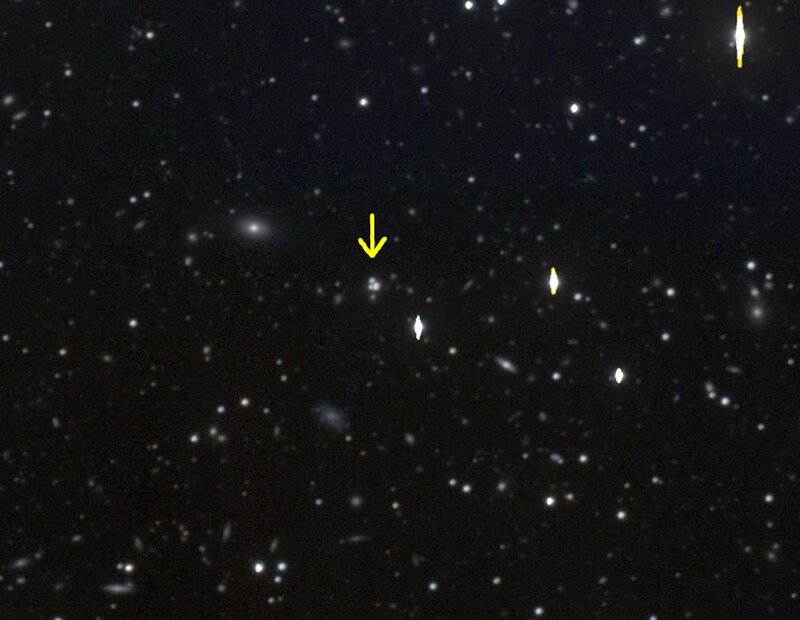 He and his collaborators developed some novel and efficient techniques for picking the most distant galaxies out of the sea of faint fuzzy galaxies visible from staring with a telescope. The further away we look in the Universe is also the further back in time we are looking, so studying the most distant galaxies also means studying the youngest galaxies. This work is very interesting, very clever, very important, and well-deserving of this prestigious award! The 2010 Kavli Prize in Astrophysics was awarded to Jerry Nelson, Roger Angel, and Raymond Wilson. The Kavli Prizes are as prestigious as the Gruber Prize. This year's recipients are all noted for their work in telescope and optical design, work that has resulted in the largest optical telescopes in the world and, in the next decade, telescopes as large as 30 to 42 meters in diameter! You can read about their individual contributions here. I have obtained volumes of exquisite data from telescopes using the various technologies acknowledged in this award, and so I heartily agree that these recipients are highly deserving! Astronomers often suffer from a disease we call "aperture envy". The astronomer with the smaller telescope is often jealous of the astronomer with a larger telescope. This is because larger telescopes collect more light, allowing you to see fainter (which often means further). I've had the luxury of using many of the world's largest optical light telescopes, which has allowed me to look at some pretty faint things, both near and far. But the size of optical telescopes is limited by the size of the glass that makes up its mirror. The largest telescopes currently operating have a diameter of 10 meters (33 feet), and in the next decade telescopes with mirrors 30 meters (100 feet) across will be built. But suppose that instead of a measly 10 or 30 meters of telescope, imagine we had a telescope with a diameter of 1021 meters, or 100,000 light-years.